Thanks to continuous improvements on clincher tires we made this wheel also available in non tubular versions for record setting track competition. Beat the disc at home in the drome ! Thanks to continuous improvements on clincher tires we made this wheel also available in non tubular versions for record setting track competition. Most fluent transition from tire to rim. Ideal in combination with 2-SPOKE front wheel! Toray 800/1000 prepreg carbon UD with defined fibre direction! Fibre/resin compound cured for one hour at 12 bar. Magnet embedded in spoke profile. 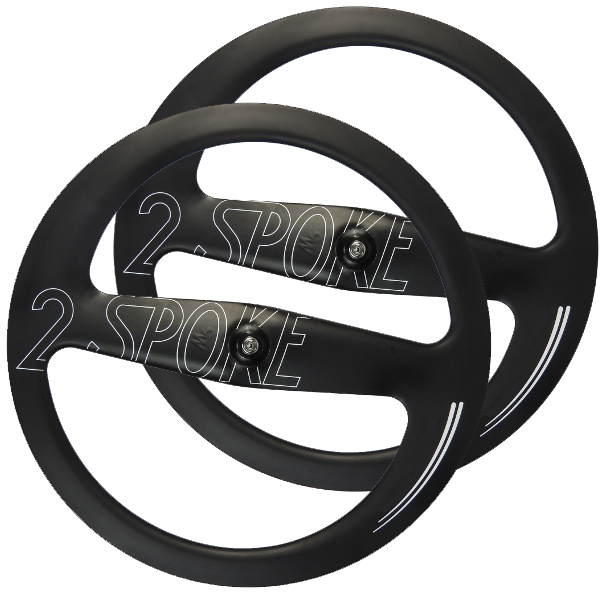 Compatible with 9, 10 or 11 speed Shimano/SRAM cassettes. Weight front wheel 910 grammes. Weight rear wheel 960 grammes.